ACR's Mary Grady is interviewed by the Japanese Broadcasting Corporation at the U.S. Climate Action Center at COP23. Speaking at USAID’s Global Innovation Week in late September, Winrock President and CEO Rodney Ferguson pledged to continue meeting the goals of the Paris Climate Agreement. Winrock International maintains that pledge every day with projects that safeguard critical ecosystems and strengthen natural resource management, including the new PIER Project (Private Investment for Enhanced Resilience), a U.S. Department-of-State-funded project that mobilizes private-sector investment to support climate-change resilience in nine countries. 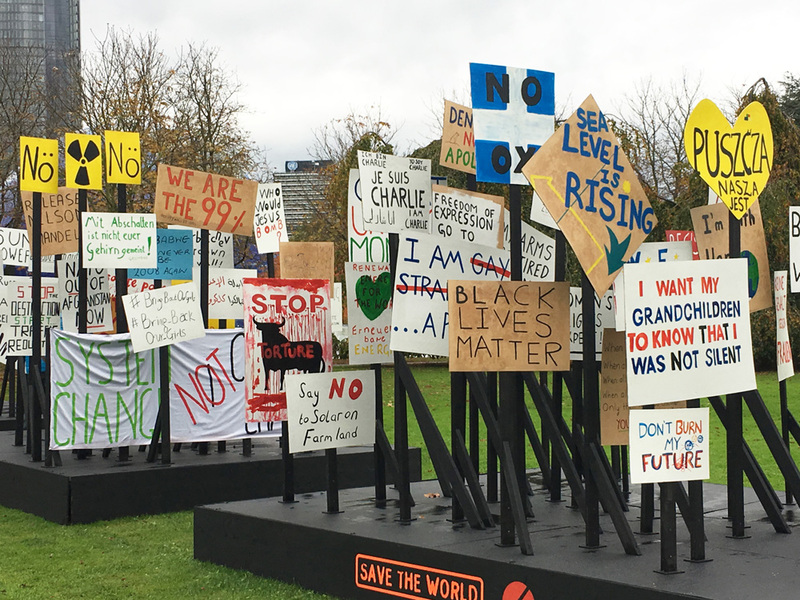 Signs at COP23 in Bonn, Germany. Winrock has also been present at the 23rd annual Conference of the Parties (COP23) in Bonn, Germany. On Saturday, November 11, the American Carbon Registry’s (ACR) John Kadyszewski, Mary Grady and Arjun Patney participated in the day-long “America’s Pledge” event at the U.S. Climate Action Center to kick off the U.S. non-national presence at COP23. In the absence of official participation from Washington, representatives of cities and states, businesses and academia were in Bonn alongside the international community to highlight climate action that extends beyond the federal government. ACR is one of 2,500 signatories of the “We Are Still In” coalition, the largest cross-section of the U.S. economy dedicated to climate action, accounting for 49 percent of the U.S. population, 54 percent of GDP and 35 percent of greenhouse gas emissions. ACR’s team participated in a variety of COP23 side events. Patney spoke on a panel on REDD+ finance, and Kadyszewski and Patney led a panel to review the California carbon market results from the first five years of market operation. 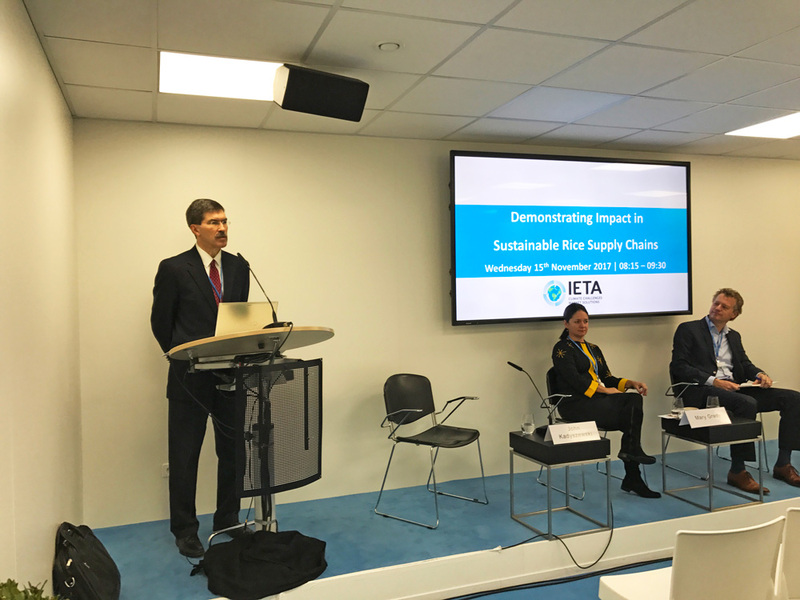 Grady was session moderator for a discussion on the operationalization of carbon markets under the Paris Agreement and a panelist on a Winrock side event on demonstrating impact in sustainable rice supply chains. 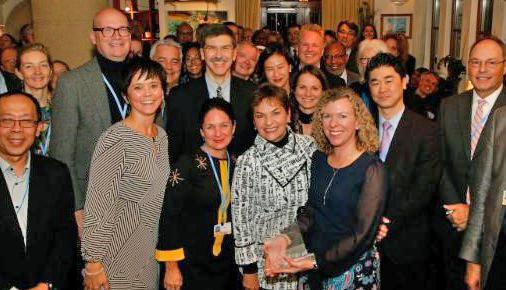 ACR’s Mary Grady (front row, wearing black and yellow) and John Kadyszewski (center, wearing tie) with former Winrock board member Christiana Figueres (front row, wearing black and white), at a dinner honoring Figures. Grady and Kadyszewski also attended a Business Council for Sustainable Energy dinner celebrating the Council’s 25th anniversary and recognizing former Winrock Board member Christiana Figueres, who recently stepped down as executive secretary of the United Nations Framework Convention on Climate Change. Figueres brokered the Paris Climate Agreement.